Set of ten illustrations which build to one large poster. Teaching the uniqueness of Jesus as the Son of God using the illustrations as numbered above. 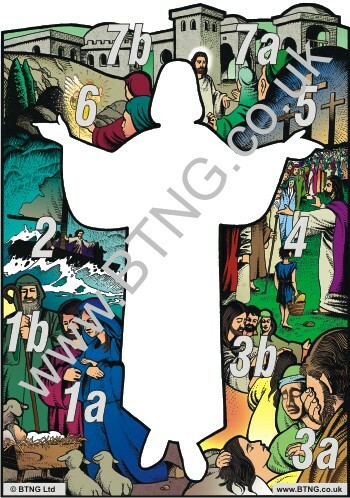 The poster assembles to show an outline of Jesus with open arms welcoming. The assembled poster size is 745mm x 525mm (note: this poster will be supplied on 200 gsm A3 card and requires each piece to be cut out prior to teaching).